I forgot the sixth most frequently asked question. (See the January 23 Post, Five Frequently Asked Questions) Can expats drink alcohol in Muslim countries like Dubai and Qatar? The answer is a simple yes. Explaining how and where is more complicated. Muslims are not supposed to drink alcohol. As to whether they actually abstain, I cannot speak from firsthand experience, as I have never been with a devout Muslim in a situation where he or she might be tempted to partake. On the other hand, secondhand sources, such as contemporary memoirs and novels as well as anecdotal evidence shared by our friends here, indicate that many do indeed drink alcohol- some heavily- in the privacy of their homes. I have heard it said that they even go to the bars where westerners flock, but they are not wearing their Arab attire when they are there. Muslims incognito, so to speak. My guess is that adherence among Muslims to this religious commandment is not unlike Christians, Jews, Buddhists, and Hindus to theirs: inconsistent and certainly not universal. Gertrude Bell’s remark above refers to a visit to Persia, where the rules were not as strictly enforced. For example, on several occasions she mentions the “fragrant wine of Shiraz” and “the choicest of the forbidden juices of the grape”. Throughout the narratives of Thesiger and Stark, who travelled almost wholly in the Arabian Gulf, on every social occasion they drank weak hot tea, camel milk, and cardamom flavored coffee. Never a mention of alcohol. On a related note, in public settings, Muslims, both men and women, enjoy smoking shisha or hookah pipes, sometimes known as Hubbly Bubbly. Tourists often assume they are smoking marijuana, but this is not the case. The smoke is flavored with herbs “made to order”. It is a rather elaborate process, involving combining herbs and tobacco, heating water in a glass container, and connecting long tubes to a pipe. 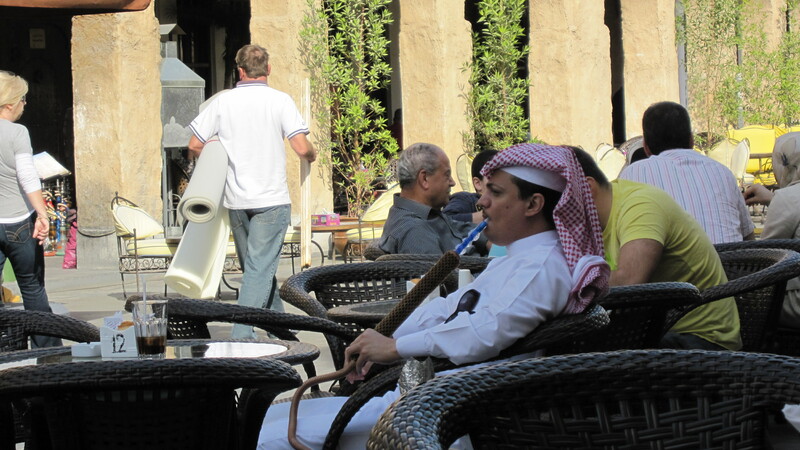 The pipe is usually shared among friends and family members, and it is an enjoyable, relaxing social custom among Arabs. I often see groups of women out together smoking shisha pipes, laughing and trading tales. These Arab women get just as lively as we American women do, all talking at once! Back to alcohol. Expatriates in both Dubai and Doha must first go through a lengthy process to obtain Residency Permits. Without those, you cannot do anything. You cannot even stay here for more than a month. For Dubai, I had to go through multiple hoops, including trips to the US State Department AND the courthouse in the capital of the state where we were wed for new official signatures on our original marriage certificate, to prove I am actually married to my husband, since he was “sponsoring” me. But that is another story. Only after you have your Residency Permit can you apply for a License to Purchase Liquor. In Dubai, there are liquor stores tucked in out-of-the-way places behind certain grocery stores. They don’t make it easy! You have to really want it in order to go to the trouble to buy it! 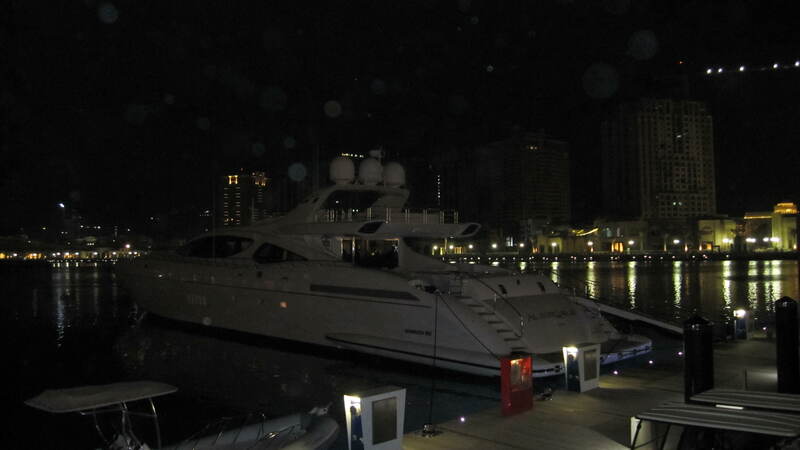 As for places to drink, restaurants in hotels and other mostly expat areas, like Palm Jumeirah, serve alcohol. 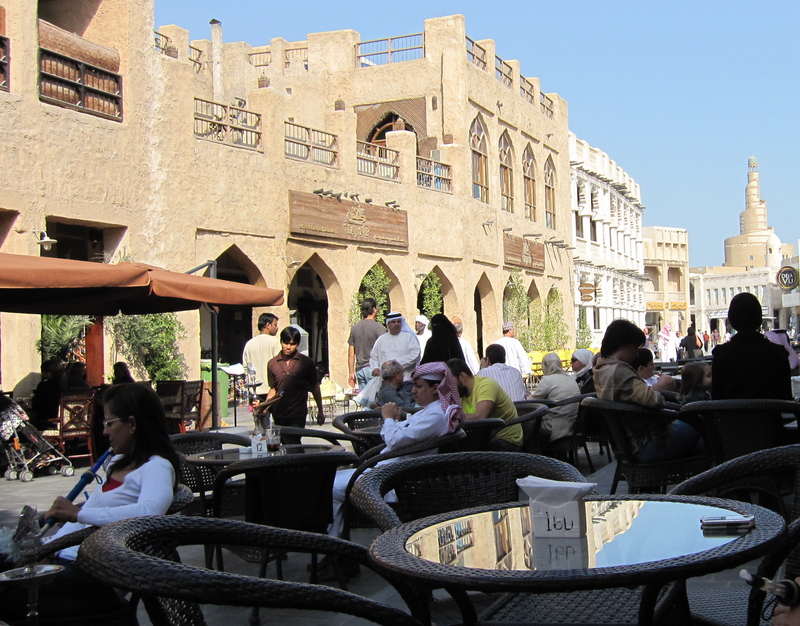 Dubai markets itself as a tourist destination, so it is fairly accommodating as it woos international travelers who want to shop in the up-scale stores and frolic on the beach. BUT do not drink on the beach! There is a limit to the government’s tolerance, and drinking outdoors in public areas is simply not permitted. 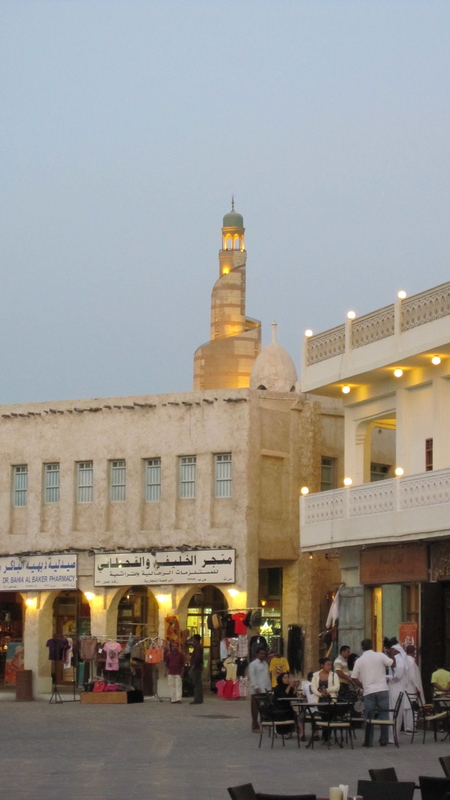 Qatar is a more conservative Muslim country, focusing on education, sports and the arts more than finance and tourism. Only restaurants in international hotels serve alcohol, along with those “off-shore” on the Pearl Island. And, up until recently, there has been only one liquor store in the entire country. That’s right. One. And it is in the middle of the desert, right next to the non-descript building that serves as the Catholic Church. Intentional? Probably. Qatar is in the process of building a liquor store on The Pearl, so that makes a grand total of two. Procuring an Alcohol License in Qatar is an even longer, more involved process than in Dubai. Among other things, your employer has to write on the form how much money you earn each month. How much alcohol you are allowed to purchase depends on how much you earn. Some assume that this is an attempt to prohibit the migrant workers from becoming intoxicated. I do not know. No comment. Needless to say, our allotment, as with all professional expats, is relatively high. Embarassingly so. How much do they think we drink? Whatever the case, on our first trip to this warehouse size store- as well supplied as one anywhere, by the way- we were soon to host an office party. Therefore, we filled a grocery cart to overflowing with bottles of wine, beer, vodka, scotch, etc. We needed assistance from the porter at our apartment to get it onto a trolley, across the lobby, and into the elevator. For the first- and only- time in my expat experiences, I confess I felt a bit like the stereotype of “the brash, showy American…” That has not kept us from going back to the liquor store and having more parties, however! A toast to your informative column!